It means that if an email is sent unsuccessfully, it will be sent again automatically. In our email delay sending application, for manual sending, you do not need this feature, because you can simply click <Send> button to send it again. 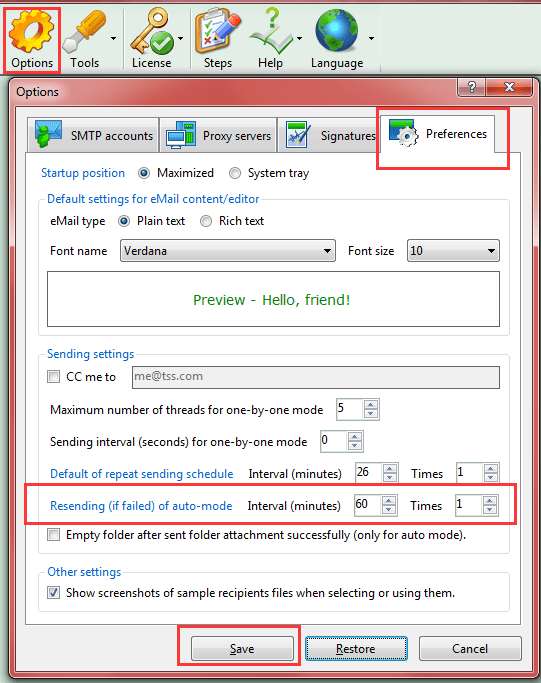 But in automatic sending mode, this feature is important; it can ensure your email to be sent out. So, our eMail auto sender presets this option for you. The default setting is retrying 1 time after 1 hour, and you can adjust this setting as you need. The retrying time(s) can be set between 1 and 3, and the interval can be set between 10 and 120 minutes. Screenshot 1: “resending if failed” setting of our automate email sending program. Please note that this mechanism cannot ensure the resending is 100% successful, but it will increase the change to send more successful emails. Usually, the failures are cause by the network connection or email server limitation, so you can use this setting for waiting them OK and getting it working automatically. In Windows, a program usually runs as a process and you can check current running processes in “Windows Task Manager”. And a process can working as multiple threads internally, usually, one thread for one task. This is a brief of “Multi-threaded”. Usually, the multi-threaded technique is used for the background tasks, such as checking if software is up-to-date, generate logs, etc. In our email delay sending software, since sending emails one by one will sent out many emails (relied on the number of recipients, one email for a recipient), it is a time-consuming operation. So our automate email sending program uses multi-threaded technique for the one by one emails sending. Screenshot 2: “multi-threaded” option in our automate email sending software. The default number of threads is 5, you can set it to 1~99. But please note that not the more the better because each thread will connect to your SMTP server. 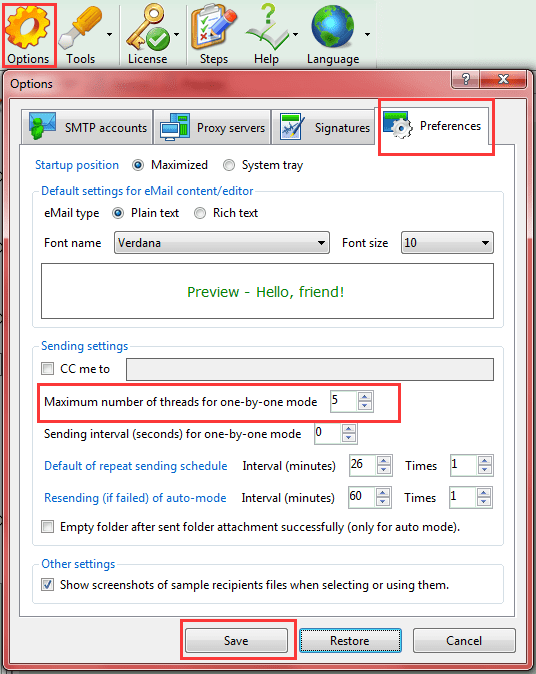 And the allowable maximums of simultaneous connections for different SMTP servers are different, so, you may need to fine-tune it to get the fastest sending for your SMTP server(s). Usually, do not need to adjust this setting unless you’re the system manager or very professional in this field. Download our eMail Auto Sender for Windows Now!